The Huskie Rocket might not be as luxurious as the Alfa Romeos a few booths down in Chicago’s McCormick Place convention center. It might not be as durable as the Jeeps or as family-friendly as the Hondas. 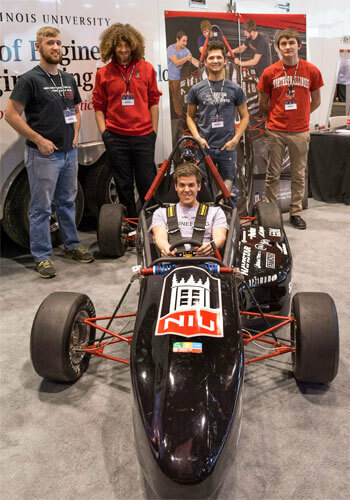 But the racer designed and hand-built by NIU students has one feature the other cars at the Chicago Auto Show lack: the car, handcrafted by Northern Illinois University students, gets more than 1,300 miles per gallon. 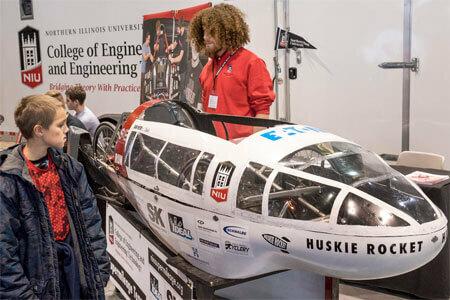 It was one of three vehicles brought to the auto show by the various SAE International teams that operate in the NIU College of Engineering and Engineering Technology. The teams build machines to compete in grueling competitions for durability, speed, mileage and even marketability. The Supermileage team last year had the third-best gas mileage in the world with 1,057 miles per gallon, but in other tests had been clocked as high as 1,359 mpg. Senior mechanical engineering major Greg Tabaszewski, 28, who worked on the dune-buggy-style off-road vehicle for the Mini Baja Team, said the experience helps him apply engineering textbook formulae to real-world situations. 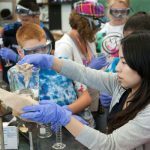 “Nothing at our school gives you as much hands-on experience as joining one of these teams,” he said. 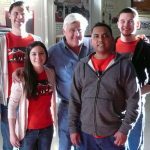 The Rocket, which appeared in a Shell commercial with Jay Leno last year, is not the Supermileage Team’s current racer. The team – mostly freshman, after a crop of seniors graduated last year – started from scratch, in large part because of a rule change that requires switching from a lawnmower engine to a go-kart engine. They’re also taking it as a chance to make their own car, making some parts lighter, others sturdier, modifying the turning radius and making other tweaks to the design. Although most of the team members are students within NIU’s Colllege of Engineering and Engineering Technology, Abbott is a computer science major. The teams are open to all comers. In addition to the Supermileage, Mini Baja and Formula teams that showed off their cars in Chicago, NIU also has teams competing in the Aerospace Design and Clean Snowmobile categories. Those last two didn’t bring their respective drones and snowmobiles to the auto show because of pending competitions. Once interested in the teams, the engineers and racers self-sort by their passions. Senior mechanical engineering major Nathaniel Bailey, 23, part of the Formula team, disagreed. “The race car was the way for me. Never really been into off-roading, but going fast is what I like to do,” Bailey said. The Supermileage car is about 100 pounds total. The driver usually weighs about 120 pounds. For the last several years, the driver has been the smallest female engineer on the team, strapped into the plastic shell. To keep the required 15 mph average speed, driver Marissa McKinney, a freshman, gets up to 20 miles per hour, then cuts the engine and coasts until the Rocket hits 10. The tires are from racing wheelchairs, over-inflated to create the minimum surface area. The best weather – for the car – is “a nice 90-degree summer day,” O’Day said. For Mini Baja, the test is a four-hour endurance trial. The Formula team isn’t just rated on the car itself – acceleration, braking, endurance, even a slalom-based autocross test – but also on its marketability. They have to go before business experts to defend their costs and attractiveness to the weekend racing community, Bailey said. 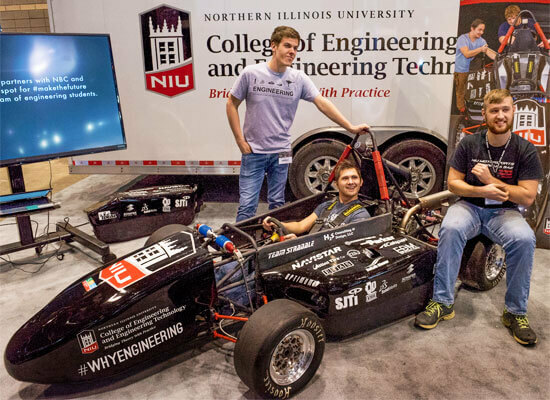 NIU’s Formula car goes from zero to 60 in four seconds, tops out at 100 miles per hour and, at 1.7 Gs, outcorners a Porsche. But the learning comes when the handmade cars don’t do what the equations say they should, Bailey said. 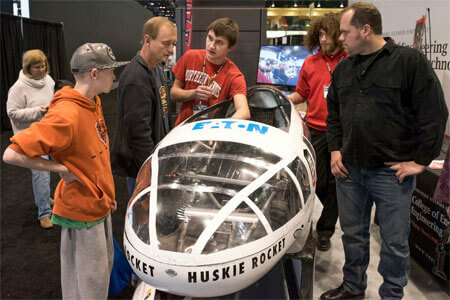 Auto show attendee Joshua Gugel was thrilled for a chance to talk shop with other SAE Supermileage racers. 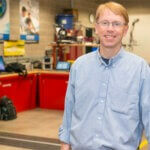 He worked on a similar project for a high school team, and had similar experiences, including flipping the racer. “It’s a risk with these three-wheeled designs,” Gugel said. The appeal of the Mini Baja car was its low center of gravity, referenced in its easy accessibility, said show-goer Joey Starett, 6, who got a quick pretend ride in the dune buggy. “It’s more easier to reach for me,” Starett said. The students build the racers in their off hours. No pay, no credit, just the thrill of a win, an accomplishment or two to lure employers and the chance to see their engineering education in practice.